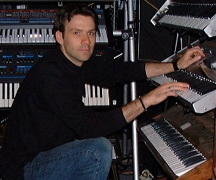 Jeffery Koepper first came to the attention of STAR'S END in the mid-1990s when he was part of the duo Pure Gamma. Their music was an interesting mix of the current modern chillout scene and old school Spacemusic. It was not long thereafter that Pure Gamma performed in Philadelphia at The Gatherings Concert Series (on 28 September 1996 and again on 2 May 1997). Pure Gamma never managed to get a full-length CD released before ceasing to make music. 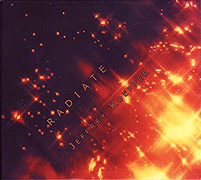 Fortunately, Jeffrey Koepper incorporated some of their lasting musical ideas into his first solo CD Etherea (2003). Followed by Momentium (2006), Koepper again demonstrated ample technical craft and compositional ability in the studio. At the invitation of Steve Roach, Jeffrey Koepper's solo concert debut was finally realized in his opening set at Roach's 19 May 2007 performance at The Gatherings - which produced enough interest to get Jeffrey into a live on-air STAR'S END radio concert on the 01.27.08 broadcast, then back on stage as headliner at The Gatherings Concert Series on 19 April 2008. His CD Radiate (71'00") was recorded on this date and features ten tracks, eight of which are live versions of works from Sequentaria (2008), one from Momentium (2006) and one from Luminosity (2009), a CD released sometime after the concert. Radiate is a sonic document of his set at The Gatherings and traverses much of the same territory as his two previous concert outings (on STAR'S END and opening for Steve Roach). With an emphasis on works from his new CD Sequentaria (released at The Gatherings that night) the set began with some vintage phase shifted synth pads, heroic E-drums and dancing arpeggio scales. Drawing on the musical era that spawned such albums as Poland, Logos and White Eagle; Koepper ran through a fascinating range of sequencer based pieces - his full-throated lead lines soaring above. His stage set-up included several keyboards, among them vintage museum grade synths - right alongside the latest retro analogue technology. Between each of the rhythmic sections Koepper lulled the audience with deep drones and airy synthetic harmonies and effects. To close out the night, Jeff played lovely chord progressions on the Prophet-8 over a simple run of tones from the arpeggiator on the Jupiter-6. Looking back, this uncluttered and pure piece of music was a perfect way to wind the concert down - with a few quiet and intimate moments spent between the artist and audience. At The Gatherings Concert Series complex stories are often told with simple sounds. Radiate is full of these human details, spoken in the public luster of the live concert.